The higher you rank in the Colosseum, the more gems. The more gems, the more you dominate. And dominating feels good. We split up the guide based on the Offensive Format and the Defensive Format. For the slow folks, the offensive format is what you use to attack other players. The defensive format is for when you are away and people “try” to attack you. And one last thing, if you see a player called Guard.2000, attack it! It’s not a trap! This headline is loaded because the true answer would be: It depends. But, because you want a single answer, here you go. This lineup is the top overall strongest unit to use in common Colosseum attacks. Of course, it won’t always work and will depend on your strength and your enemies lineup. See below for a more detailed rundown. My Top Offensive Lineup: Trickster, Prima Donna, Rose Night, Tracker, and Black Crow. This is just my lazy lineup. Now, of course, to truly rank you can never just have a default lineup. Each offensive lineup should be determined based on the defensive lineup. The best thing to pay attention to are the strengths of your opponent’s heroes and try and counter it. I will soon expand this article to break down which hero counters which hero. Obviously, the strength number is going to be your friend when it comes to determining a target. To learn how to catapult your strength number, skip to Hero Might section below. Keep an eye on the Constellations, but this general Defensive Team is better than any other team that you can make from the free fighters. In my experience, the defensive team always has a strong advantage and so this team is almost unstoppable! My Favorite F2P Lineup: Trickster, Prima Donna, Rose Night, Tracker, and Black Crow. Secondary F2P Combo: Prima Donna, Rose Night, Death Night, Demon Slayer and Tracker. To set up the Defensive Formation, navigate into the Colosseum and click the button Defensive Formation as shown in the image below! Obviously having the heroes at level 60 with all the shards attached and powered up to gold will help them really carry the punch. These formations will also be quite intimidating even without all the characters being maxed out. Guard.2000 is the code name for the automated replacement fighter who takes the spot of a player who leaves the kingdom or quits. The default heroes in the Guard.2000 team look ominous and scary but they are actually very weak. Killing them is basically guaranteed unless your fighters are truly hopeless. I always attack Guard.2000 so long as he is more than 20 spots above my position. I always cycle through the fighters a bunch of times to check if there is a Guard.2000 before I find another player to attack. Why is his name Guard.2000? I have no idea, but my guess is that his name is a lot better than yours. Stop judging. How to Build up your Hero Lineup Ranking? Your ranking number doesn’t mean you are going to win a battle, but it is a good indication of how strong you are. The more powerful your might, the better indication that you’re doing things correctly. Overall Player Level. Your heroes can only be brought up to the hero level of your overall player level. 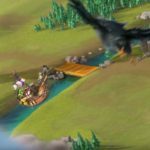 You can increase your player level by fighting monsters, clearing stages, winning colosseum battles, and finishing as many quests as possible. Reach level 60 to max your heroes. Trophies. This is completely underrated and I’m not sure why. The trophies and their corresponding ranks will turn your hero from being a wimp into being unstoppable. Each trophy will add so much power to your hero. Don’t stop collecting until each hero is maxed. Hero borders. The heroes have rankings that start from Grey -> Green -> Blue -> Purple -> Gold. Please note that the colored rankings are not near as important as the trophies. Paid Heroes. Some of the paid heroes are incredible in the Colosseum. See below for a complete rundown. This is one of my favorite lineups (with Lore Weaver instead of Prima Donna). Note my #1 ranking! Getting to the top takes work. Staying up the top is really hard. You will need to learn all the counters and pay attention to the clock. Ensure that you reclaim number 1 a few minutes before the clock restarts! 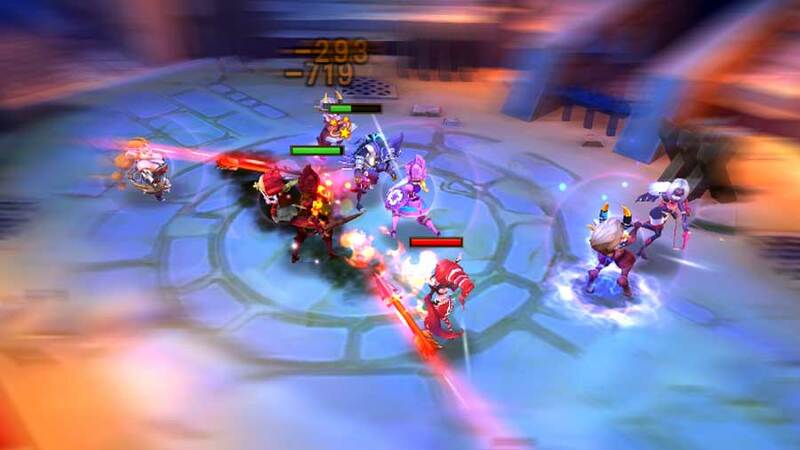 There are many great paid heroes that will help you crush your enemies in the Colosseum. I’m picking the best paid-heroes based on cost and skill. Lore Weaver. She is an incredible healer and a priceless asset in the Colosseum. Once she is maxed, she is tens of times better than Prima Donna. For the complete rundown between the two big healers, click here. Don’t forget that Lore Weaver is also an incredible battle skills hero. Witch Doll. She traps your enemies in their spot for a few seconds. She has a very powerful colosseum assist. Her bonus battle skills give you awesome research, building and training boosts. Grove Guardian. One of the most powerful heroes in the Colosseum. Even without maxing, this hero is deadly. Get him if you have the money, and avoid going against him if you see him. His battle boosts aren’t great and so only get him if you want to own the Colosseum. He is especially strong against a strong magical enemy. Here is my best paid offensive colosseum lineup based on the paid heroes that I have! This lineup is really effective against a heavy tank defensive lineup. It’s really fun to watch this lineup work its magic. Mind the pun! Please note that I will probably change my mind on this lineup, but for now, I’ve been enjoying watching my enemies fall. What is the Colosseum Constellation? Okay. Think of the real constellations! Now forget the real constellations and instead think of an arbitrary system that gives more power to specific heroes based on the trope-like quality they possess. It’s basically all the problems with stereotyping and racial + gender profiling all wrapped into one statistic. Click on the star in the top left corner and the game will tell you which criteria gets a boost. It will also inform you of the boost. The Colosseum boosts do help, but I still usually stick to my usual setups. This is the ranking chart for the 1-30 top players of the ColosseumPrizes are gems. It’s really that simple. Every 3 hours, Lords Mobile determines your ranking and rewards you accordingly. If you are ranking #1 in your kingdom, you will receive 500 gems every 3 hours. That is a lot! If you are ranking within the Top-1000 of your kingdom (which isn’t very hard), you will get at least 64 gems every 3 hours. So long as you are ranking in the top 5,000 you will get a least a few gems every cycle. 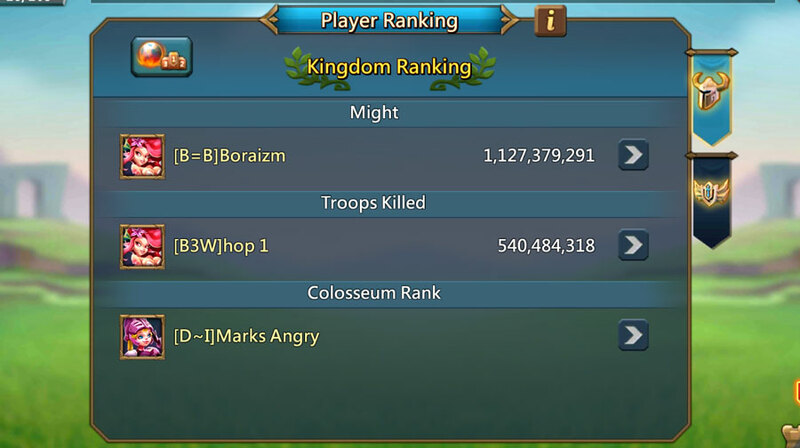 The gems really add up and ranking in the Colosseum is one of the most effective ways to generate free gems in Lords Mobile. This is a question that I get flooded with from the contact form. I do plan on creating a counter chart. I first want to finish more articles. In the meantime, I will leave you with a few rules that will help you learn how to pick your heroes. If you see an enemy team with no healers (i.e. prima donna or lore weaver), make sure you go with 4 large (tank) heroes and add your healer. Putting no healer into the lineup is really dumb. Take advantage of their stupidity! Example of good tanks, in order of effectiveness: Rose Knight, The Big Guy, Death Knight, Child of Light, and Oath Keeper. If the other team has healers, you may want to use the Demon Slayer. Keep in mind that the Demon Slayer may cause you to keep refreshing the healer which will cause you to lose. The Rose Knight (which should be in almost every lineup anyways) and the Trickster are good defenses against the Demon Slayer. They aren’t always effective. To combat a double healing lineup (i.e. 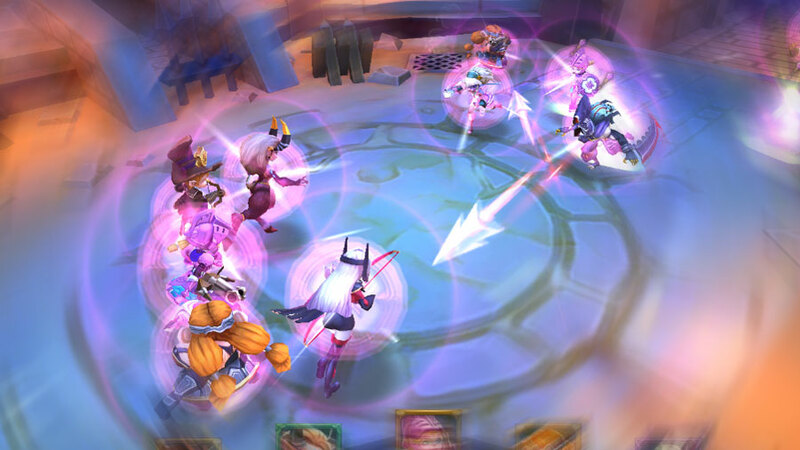 they have Prima Donna and Lore Weaver) you will have to use agile attackers like Demon Slayer and Scarlet Bolt. If Shade with high specs, you can throw him in as well. You will want to kill both healers quickly or you won’t stand a chance at winning. Once they are gone, you will only have 3 real heroes to fight. As mentioned above, the only good counter for the Rose Knight is the Rose Knight. Period! Q: Should I max up the medals of one player at a time straight to gold or work slower and upgrade all of them together? A: Definitely, focus on one at a time. The Gold Heroes are powerful for the entire game (not just for the Colosseum) and the Gold Heroes are a LOT more effective than the Grey Heroes… The most important objective is to get the critical heroes to green as soon as possible. Q: Why am I not able to get up to Ranking #1? A: Easy. You’re bad at this game! 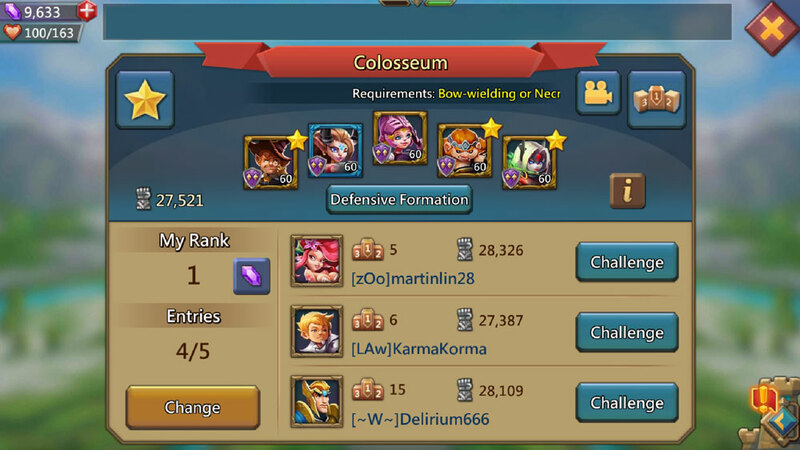 Q: What is more important for the Colosseum: border color or trophies? A: Trophies are far more important. Focus on trophies and hero level before focusing on border color.